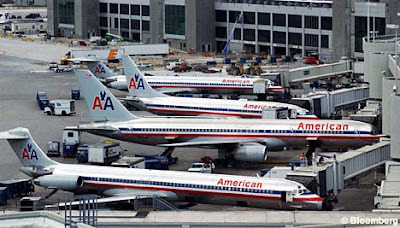 While the aviation industry attempts to push back (as is seen in video below, courtesy of Reuters) on the recent opposition by environmentalists, American Airlines just today commits what is being called one of worst environmental acts of all time. The airline is being slammed by environmentalists for a 4000 mile journey it took with just five passengers on board (on a flight big enough to suit 245 people). The nine hour trip used some 22,000 gallons of fuel (approx. 4,400 per passenger). The event has just been labeled as one of the "worst environmental crimes ever" as it caused an astounding 43.2 tonnes of CO2 per passenger. The flight took place as a result of an 11 hr delay due to a mechanical error. Most passengers made other arrangements. Rather than cancel the flight, the airline decided to make the trip, as passengers were waiting for a flight in Heathrow Airport in London (site of the recent Greenpeace protest earlier this month). Richard Dyer, of Friends of the Earth, said: "Flying a virtually empty plane is an obscene waste of fuel.Through no fault of their own, each passenger's carbon footprint for this flight is about 45 times what it would have been if the plane had been full." The flight resulted in a carbon footprint equivalent to driving a car 123,000 miles or the energy use (gas and electric) of one household over five years. Campaigners and activists from several organizations, including Greenpeace are infuriated. Anita Goldsmith, for Greenpeace, accused the US airline of putting profit before the environment. "Aviation is the fastest growing source of climate changing emissions, " said Goldsmith "yet here we have another example of the reckless approach the industry takes when it comes to a choice between profit and convenience over the environment and all our futures." Environmentalists are pushing for immediate legislation that would to force airlines to pay for carbon offsetting rather than passing it on to passengers. Mr Dyer, of Friends of the Earth, added: "Governments must stop granting the aviation industry the unfair privileges that allow this to happen by taxing aviation fuel and including emissions from aviation in international agreements to tackle climate change." The event is sure to add further scrutiny of aviation industry practices.